April 18, 2004 Joe Bergen from Lock Haven P.A. returned to Seneca Lake and caught his first landlocked salmon ever. The fine specimen was a feisty 6 pounder. It was caught on a watermelon Hi Tech spoon trolled at 2.5 mph about 50 feet down in 100 feet of water. The recent heavy rains have really clouded up the normally clear Seneca Lake. The fish were hanging right in the middle of the lake where the clearer cold lake water of 38 degrees was mixing with the canal water of 46 degrees. Trolling was a bit difficult as there was a lot of debris in the water column from the recent storms. The 2004 fishing season is off to a good start. Atlantic salmon are known for spectacular leaps and sudden burst of speed, hence the scientific name Salmo salar which means to leap in Latin. The Atlantic salmon in NY waters are a variety of Landlocked salmon. They are raised at the Adirondack Fish Hatchery in Saranac Lake and stocked in over 50 waters throughout New York State. 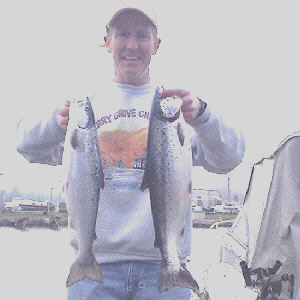 Atlantic salmon differ from king and coho salmon, because they survive the spawning process and spawn several times. Since very little natural reproduction occurs, annual stocking is required to maintain a desirable population size. In the spring, Atlantic salmon are found in the shallower waters. Once water temperatures reaches the upper 50's, they will move offshore into deeper water. Here they will feed heavily on smelt and alewives. Fisherman looking to target Atlantic salmon will use downriggers, lead-core line, and dipsey divers to get the lures to the desired depths. 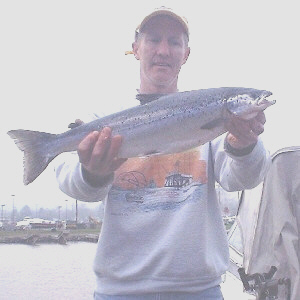 The current state record for Atlantic Salmon is 24 pounds and 15 ounces and was caught by Mike Dandino on April 5, 1997 from Lake Ontario.